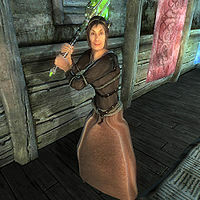 Andragil is a Bosmer commoner living in Bravil. She is also the master trainer in Block and will test your skills to the fullest once you have gained the necessary references from the advanced trainers. She can be found living a simple life in her home. Andragil goes to bed at midnight, sleeping until she wakes up at 6am. She then wanders around her home until 10pm, where she finally has a late dinner for a couple of hours. She is available for training at all hours except when eating and sleeping. Andragil's clothing consists of a brown shirt, a tan linen skirt, and quilted shoes. She also carries a leveled amount of gold plus her key. Even the other experts of the Block skill acknowledge her great ability. Ambroise Canne will advise you: "You want more training? Then you'll have to find Andragil. I learned most of what I know from her. I think she's living in Bravil these days. You should look for her there." and Lum gro-Baroth agrees, "If you need more training, you'd better head to Bravil and track down Andragil. She taught me a few things I didn't know." They both tell you to "Look for Andragil. You can find her living in Bravil." When you ask for training, she'll say, "You want training, from me? Well, perhaps I can accommodate you. If you're worth the time and effort, that is. I think a little test is in order." Then she'll say, "Thinking you know how to use a shield is one thing. Actually using one is quite another. So here's what we're going to do. We're going to find out whether or not you can hold up in combat. You put up your shield, and I hit you. If you're still standing when I'm done, you've earned the right to learn what I have to teach. Shall we find out what you really know?" If you decline, she will say: "No? Suit yourself. You know what you have to do if you ever want training from me." When you finally accept her challenge she will say: "Now, put up your guard, and let's begin. I'm losing interest in this." She will then proceed to hit you with her warhammer. After an exhausting forty-second beating from Andragil, and if you are still standing, she will finally grant you her training: "Nicely done. You want training from me, you've got it." Andragil possesses dialogue for two conditions during the test. If you draw your weapon against her, she was supposed to cancel the session with the words: "Didn't I tell you no weapons allowed? Clearly this isn't important to you. We're done here." Should you drop your shield during her test, she was supposed to get equally angry: "I told you not to drop your shield! We're done here." The two pieces of dialogue can never be heard, however, as the necessary script is commented out.